Norwich moved into the Championship's top six with a hard-earned win over fellow play-off chasers Wolves. Bradley Johnson headed in Nathan Redmond's corner to give the home side the lead in a first half lacking clear-cut opportunities. Wolves improved after the break and Benik Afobe lost control of the ball when through one-on-one. But the Canaries ensured a comfortable finish when Lewis Grabban completed a well-worked move in the 67th minute. Just two points had separated the sides before the game, but Norwich were able to capitalise on Brentford's defeat at Charlton to move into the play-offs for the first time since early November. 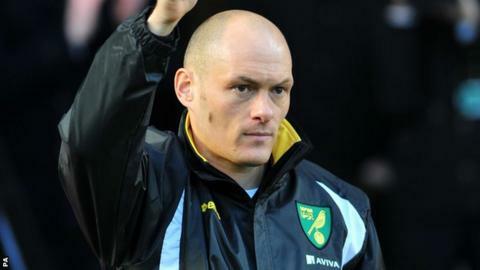 The appointment of Alex Neil as manager in January has instigated a resurgence for the Norfolk side, who have now won three matches in a row and five of the Scot's seven games in charge. Wolves were starved of creativity at Carrow Road, where they suffered just a second loss in 11 Championship outings. But long-distance efforts aside, they had managed to frustrate the hosts until Johnson found the space five yards out to flick in Redmond's corner just before the half-hour mark. Wolves had rare opportunities through Afobe, who fluffed a one-on-one and then shot wide, before Norwich secured the points with a goal that started deep in their own half. Sebastien Bassong drove out of defence with the ball and slipped in Martin Olsson, who rolled the ball across to give Grabban a simple finish. Grabban forced Wolves keeper Tomasz Kuszczak into a fine save late on, as the Canaries eased to three points. "I'm not too interested about moving into the top six. The stat I'm really interested in is that we have now won five out of seven, and that is good form in anybody's book. "Looking at the match overall that's probably the best 90 minutes I have seen from the lads. "No disrespect to (recent opponents) Blackpool and Charlton but games like these are the ones we will be judged on and to have produced such a good performance, especially in the first half, was very pleasing." "To be honest Norwich eased us out of the game and we were never able to build up a head of steam. It's disappointing after the way we played at Huddersfield on Tuesday night (in a 4-1 win). "But we have still got 15 games left and there is still an opportunity for us. I think we need 30 points, two a game from now on in, and that is perfectly possible. "That would get us up to 78 points and that will usually get you in the play-offs." Match ends, Norwich City 2, Wolverhampton Wanderers 0. Second Half ends, Norwich City 2, Wolverhampton Wanderers 0. Corner, Wolverhampton Wanderers. Conceded by Russell Martin. Hand ball by Jonny Howson (Norwich City). Substitution, Norwich City. Javier Garrido replaces Martin Olsson because of an injury. Delay in match Martin Olsson (Norwich City) because of an injury. Cameron Jerome (Norwich City) wins a free kick on the left wing. Substitution, Norwich City. Cameron Jerome replaces Gary Hooper. Corner, Norwich City. Conceded by Tomasz Kuszczak. Attempt saved. Lewis Grabban (Norwich City) right footed shot from the right side of the box is saved in the bottom left corner. Substitution, Wolverhampton Wanderers. Scott Golbourne replaces Kortney Hause. Attempt saved. Benik Afobe (Wolverhampton Wanderers) right footed shot from the right side of the box is saved in the bottom left corner. Delay in match Bradley Johnson (Norwich City) because of an injury. Foul by Tony Andreu (Norwich City). Goal! Norwich City 2, Wolverhampton Wanderers 0. Lewis Grabban (Norwich City) right footed shot from the right side of the six yard box to the bottom left corner. Assisted by Martin Olsson. Substitution, Norwich City. Tony Andreu replaces Nathan Redmond. Corner, Wolverhampton Wanderers. Conceded by Martin Olsson.